Ugly sweaters are in my top five favorite things about Christmas. Cookies are somewhere on that list, but mashing the two together? That’s GENIUS. And I am going to show you how to decorate ugly Christmas sweater cookies! YOU’RE WELCOME. You know what’s great about these? They can be wonky and weird, and not perfect. That’s why we love ugly Christmas sweaters, right? Also, can we talk honestly about royal icing? It’s… gross. For lack of a better description. Well, I think it’s gross in mass quantities. I know, I showed you how to make perfect looking Christmas cookies with royal icing in this post. Does that make me a hypocrite? Probably. But at least I admit it! So, does that actually make me a hypocrite? Is this blog post turning into a philosoraptor meme? HOWEVER. Royal icing tastes just fine in small amounts, like it is on these ugly Christmas sweater cookies! So we have ourselves a win-win situation. Ugly Sweater Cookie Cutter. I used this adorable set from Goodcook. 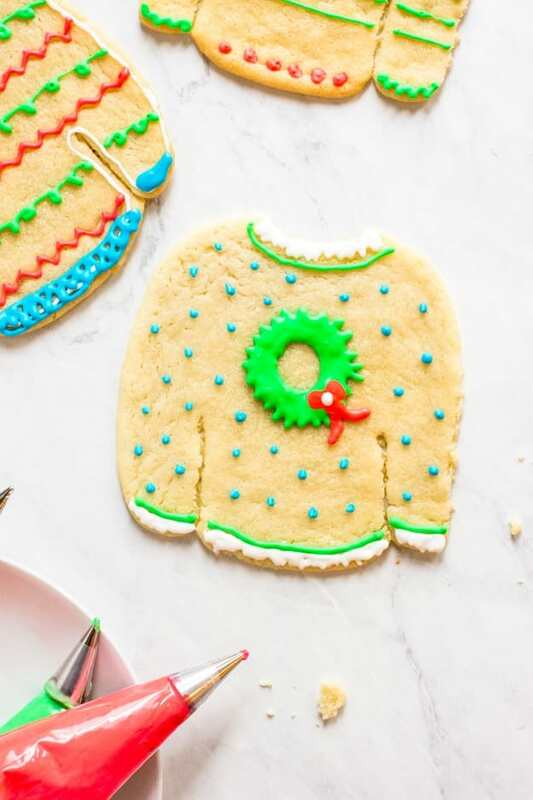 It makes a nice size cookie so you have plenty of room to decorate, and it has this fun doodad where you can roll three different patterns onto the sweaters. Cute! No. 2 Round Decorating Tips. This is the tip size I prefer when using royal icing. It’s small enough to make intricate details and large enough to cover larger spaces for flooding. (That’s some cookie decorating vernacular for ya!) By the way, you need at least four! Icing Bags. I buy these bags in bulk from Amazon. It’s nice to have about 100 extra on hand, because I always screw up the first couple when I’m putting on the tips. Gel Food Dye. I use this stuff. It’s very saturated. Make sure you wear gloves when handling it though! Also, if you are morally opposed to using artificial food dyes, this makes a pretty and natural red, and this makes a great natural green. You ready to get to it? I thought so! Grab the recipe for the royal icing below (just don’t use too much, haha) and written instructions on how to decorate the cookies. Have fun! Learn how to decorate ugly Christmas sweater cookies with icing in this step-by-step tutorial. In a mixing bowl, whisk egg whites and vanilla extract with an electric mixer on low speed, until foamy. Slowly add in powdered sugar until the shiny and stiff peaks form. Divide icing into separate bowls for desired icing colors. Mix in a pea-sized amount of gel food dye until blended. Pour each color into separate piping bags, fitted with a #2 icing tip. (Pro tip: place bags in a large glass and roll down the bags to make a cuff before pouring in icing.) Twist top of bags to seal off, holding the thickest part of the icing bag to squeeze out icing. Hold near the bottom at the tip with other hand to smoothly decorate your cookie. Create an icing outline on the sugar cookies first. If using the pattern tool, fill in patterns with royal icing. Add zig zags, polka dots, and stripes. 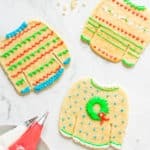 Make sure to add hems and collars to the ugly sweater cookies for a finished look. Allow to set for 5 minutes and then serve.